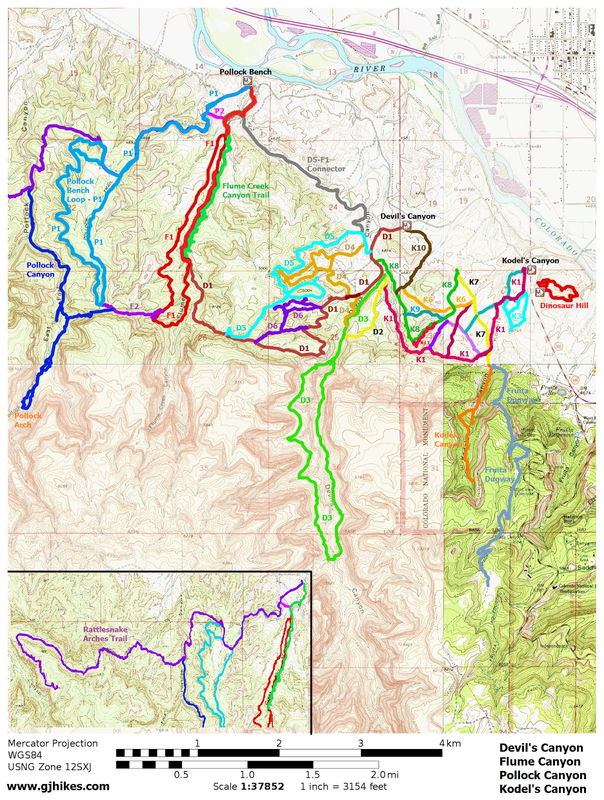 The K9 trail is located in the Kodel's Canyon Area of the McInnis Canyons National Conservation Area near Grand Junction and Fruita, Colorado. The trail begins off of the K8 trail between the K10 and K11 trails and ends once again at the K8 trail near the same point that the K4 trail begins. The K9 trail by itself is less that a half mile in length one-way but getting to and from it will add at least another 2 miles of hiking. This post begins at the Devil's Canyon trailhead which is a little closer to the K9 trail than the Kodel's Canyon trailhead is. From the parking area follow the D1 trail for a half of a mile to where the K8 trail begins on the left. Continue on the K8 trail as it crosses the wash that drains Devil's Canyon and begins climbing the ridge. The views of the Devil's Canyon area from the ridge make the climb all the more worthwhile. The K8 trail will first pass the point where the K10 trail begins before getting to the start of the K9 trail. From the K8 trail the K9 trail heads east into the middle of the Kodel's Canyon trails area. As the trail heads east it gradually drops in elevation and eventually enters a small draw. Wildflowers are plentiful in the area all through the spring and early summer months. Within less than a half mile the K9 trail comes to an end when it once again rejoins the K8 trail. 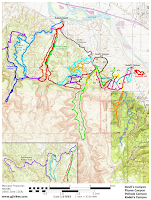 The K9 is a short trail but it can be combined with any of the other dozen or so trails in the Kodel's Canyon area to create a tailor made hike that suits your needs. That is typically what various trail runners do everyday to get their workouts in. For us we hiked the K11 trail next and then went exploring around the lower end of the K8 trail before taking the K10 trail back to the Devil's Canyon trailhead. If you would like to see it for yourself then all you have to do is 'Take a hike'.